Senyorita Lakwachera: Guide on getting your NSO Birth Certificate via phone. 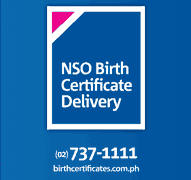 Guide on getting your NSO Birth Certificate via phone. This post is neither a fashion nor a travel post but is somewhat related to the second. Last month I decided to start renewing my government documents for Passport application. Yes, Passport application, I guess now is the time to get mine after a long lazy days of declining to experience the long chaotic lines in government offices providing the required document for this application. Good thing they now have better ways to claim these documents, and, these new ways impressed me so much reason why I’m posting. Bet this would be very helpful. One of which is claiming your NSO Birth Certificate online which is done in 7 easy steps via Teleserv. No need to go through all the annoying deep lines in the City hall, all you have to do is to follow below guide and wait for 2-3 business days to get your document delivered. I got mine in two days by the way on the cost of 350.00/copy including the delivery. 3. You will be asked to provide the following information. 4. Before the call ends, you should be able to obtain a reference number as well as an option for the mode of payment. We chose Metrobank Payment since we are very close to one of their Pasig branch. 5. Go to the payment center of your choice and settle your payment. For those who are going to pay in Metrobank you have to fill up the Green Payment Form with the reference number as the account number and your name in the account name. Indicate the amount and proceed to the cashier. 6. Call them to confirm the payment. Your payment is said to post on their system every twelve midnight. So you would like to follow up with them the next day to ensure your payment is received. PLEASE NOTE: by any chance that you are unable to receive the document by yourself you will need to provide your representative a copy of your ID and a signed authorization letter for them to be able to receive it on your behalf. This process is highly recommended for kababayans abroad as you can just ask someone you trust to claim it for you. Also for those who don't have any NSO centers near you as they deliver anywhere in the the Philippines. ANOTHER OPTION IS COMING: I got an invitation for the Launching of Teleserv’s online NSO birth certificate processing. I hope I could attend, and if I can I will update this post with the new process. Disclosure: I am not in any way connected to Teleserv, this is purely sharing of a good experienceJ. we usually use the services of the online site, www.e-census.com.ph. oh! online talaga yan :) good to know mukhang mas cheaper yung e-census compared to teleserv. does the 315 includes the delivery charge?